I grew up hearing the word jugaad as commonly used in India and Pakistan to describe any unsophisticated, often dangerous, contraption built on the fly to solve a pressing problem to make do in the absence of a better, more elegant solution. 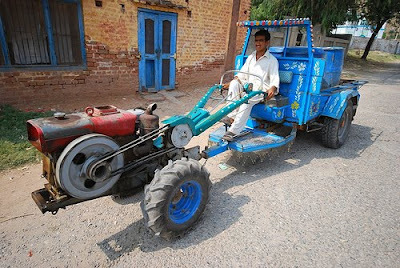 Jugaad is how the mechanics in India and Pakistan manage to keep very old and outdated machines running with crudely made parts, long after the original manufacturers have discontinued making them. Now, a few Indian management gurus in the West have a found a way to sell jugaad as a sophisticated management technique to industry and academia. An example of it I saw during one of my visits to India nearly killed me when my driver almost ran into an nondescript vehicle on the road between Delhi and Agra. It was a makeshift diesel engine mounted on a wooden cart with no lights or safety devices of any kind being used in near darkness to transport people. After the near-miss, it was described to me as Jugaad, with the warning to stay away from it, and other contraptions like it. In a recent Upper East Side New York conference that attracted a dozen executives from companies including investment banks Rothschild and Goldman Sachs (GS) and tech research firm Gartner (IT), the invited speaker Navi Radjou, who heads the recently formed Center for India & Global Business at England's Cambridge University, talked up jugaad as the latest and greatest management innovation from India. Already, companies as varied as Best Buy (BBY), Cisco Systems (CSCO) , and Oracle (ORCL) are employing jugaad as they create products and services that are more economical both for supplier and consumer, according to Reena Jana of Businessweek. "In today's challenging times, American companies are forced to learn to operate with Plan Bs," notes Radjou. "But Indian engineers have long known how to invent with a whole alphabet soup of options that work, are cheap, and can be rolled out instantly. That is jugaad." The age-old South Asian improvisation idea has found sufficient appeal to spawn a cottage industry offering jugaad instruction. Prasad Kaipa, a former manager at Apple's (AAPL) in-house training university, uses jugaad in the courses he's teaching at Hyderabad's Indian School of Business. The University of Michigan's Ross School of Business, where high-profile Indian-born professor C.K. Prahalad teaches, has opened a research office near Infosys' headquarters in India so faculty members can observe how Indian software companies come up with ideas. McKinsey consultants have begun talking up jugaad principles with clients, too. Jugaad is the kind of new fad that has generated a lot of media buzz, thanks to the hype about everything Indian in the Western Press. Beyond the Businessweek story, the popular TechCrunch website has a post with the headline: "Can India Jugaad Its Way to Angel Investing?" The Wall Street Journal decided not to be left out of the buzz by publishing an article titled: " India's Indigenous Genius: Jugaad". The idea that global companies can do good and do well at the “bottom of the pyramid”—that is, among the poor populations of developing countries—has generated excitement among corporations, governments, and NGOs in recent years. Understanding the need to design for extreme affordability with scarce resources is giving birth to a new generation of entrepreneurs. These are entrepreneurs with a social conscience who are motivated by the desire to do good and do well at the same time. They are finding new ways to empower the poor by satisfying their basic needs, such as water, electricity and telephones, but the jugaad concept being taught by the Indian management gurus is definitely not for the social entrepreneurs in South Asia. Personally, I think this jugaad idea is just another management fad, and a potentially dangerous one that encourages cutting every possible corner. "Jugaad means "Somehow, get it done", even if it involves corruption," cautions M.S. Krishnan, a Ross business school professor. "Companies have to be careful. They have to pursue jugaad with regulations and ethics in mind." ''Jugaad"" is nothing new!Another way of putting it is that necessity is the mother of all inventions.big deal! what a piece of crap (pun intended) ! I'm just befuddled with the marketing of anything indian - Americans' love for the exotic gotta have some bottom ! Let's give credit where it's due. Regardless of substance, Indians have done a terrific job of PR and brand management in the West. And they are joining the image makers in the western media, the academia, policy think tanks and the world of finance, helping boost brand India and the power of the Indian lobby to new heights. Come on Riaz. You can do better than a back-handed "compliment" like that. Comes across as an envy-ridden opinion. Tell us it's not so. Well, I think you got the concept "jugaad as export" wrong. It's not so much about exporting these odd virtual killing machines to the west, but more so about the spirit of getting things done, somehow, someway, against all odds. You can say, non-optical but greedy best fit approach. As far as jugaad is concerned, TATA's nano can be called a jugaad. So do their recently released water purifier (The Tata Swach) using a nano filter made from Rice husk, which is extremely effective even in villages and is one tenth of the cost. So are the Dabbawallas (http://en.wikipedia.org/wiki/Dabbawala) in Mumbai which have a six sigma precision and have been taught as a case study in virtually every business school, be it east or west. anon: "Come on Riaz. You can do better than a back-handed "compliment" like that." India has made significant strides in the last decade. But hype, by definition, is the amplification of reality. In India's case, the basic reality of it being a third world developing country with hunger, poverty, illiteracy, lack of sanitation, poor physical health and low levels of human development has not changed. Instead of hyping India and promoting its jugaad culture in the West, the Indian management gurus should find a way to translate India's growth into improved living conditions for the vast majority of its citizens who are among the poorest, most backward and least educated people in the world. "Jugaad means "Somehow, get it done", even if it involves corruption,"
Common, you mean to say that there is no corruption in usa. I think USA has the highest level of corruption which is covered in the name of lobby. Even the bailout, fed has not disclosed approximately 2.1 trillion bailout details in spite of court cases under RTI. same logic, everything is relative and indians are still less corrupt than americans. Corrupted the whole world for wmd of iraq and pakistan current state for screwing russia. Finally what matters, is what sells and your article very clearly says that india sells. That is fine. anon: "Common, you mean to say that there is no corruption in usa. I think USA has the highest level of corruption which is covered in the name of lobby. Even the bailout, fed has not disclosed approximately 2.1 trillion bailout details in spite of..."
Just do a half-assed job! Bart: It's the American way! Needs some time to rest his feet. Chief Wiggum: Fighting crime is not my cup of tea! Shary & OFF: It's the American waaaaay! "Instead of hyping India and promoting its jugaad culture in the West, the Indian management gurus should find a way to translate India's growth into improved living conditions for the vast majority of its citizens who are among the poorest, most backward and least educated people in the world." did you bother to give your priceless wisdom to oil rich arabs. arabs remain one of the most backward people education wise. anon: "did you bother to give your priceless wisdom to oil rich arabs. arabs remain one of the most backward people education wise." It seems you are so caught up in the Indian hype that you have detached yourself from reality. The accepted international measure of human progress is UNDP's human development index that puts India at #134 on a list of 182 countries. Almost all of the Arab nations are significantly ahead of India in terms of HDI. They are better fed, clothed, educated and cared for than Indians. "Almost all of the Arab nations are significantly ahead of India in terms of HDI. They are better fed, clothed, educated and cared for than Indians. " Arabs They are the ones who come to India for medical treatment (there is seperate visas for them). In fact they top the medical tourist visa. So much for being taken care of better than India. So much for their high class education. They also have small quota in IITs and they perform the worst. They take about 6-7 yrs to graduate (as opposed to 4 yrs). I know it first hand. I know, being a muslim, you have to support all muslims. But a little bit of reality does not harm. "It seems you are so caught up in the Indian hype that you have detached yourself from reality. " It seems you have forgotten the book you read "The world is flat". In that it was mentioned that since 1980s, all arab world put together has around 250 US patents in technology. In comparison, in one year alone (I think 2005), India has over 2000 US Patents". That my friend is reality. The harsh reality that muslims are laggard in education. Anon: "Arabs They are the ones who come to India for medical treatment (there is seperate visas for them). In fact they top the medical tourist visa. So much for being taken care of better than India. So much for their high class education...."
Seeking medical treatment offered by a few doctors trained in the West is not a confirmation of India's superiority over the Arabs. Instead of a few individuals or exceptions, look at the broad picture. In terms of basic literacy, longevity, access to education, food, healthcare etc, there are very few countries in the world which are as deprived as Indians. You advise me that "a little bit of reality does not harm". I think it's you who is deluded based on the individual successes of a small minority of Indians while ignoring the extreme poverty and low literacy and poor health of the vast majority of Indians. India, often described as peaceful, stable and prosperous in the Western media (notably Friedman, Zakaria, et al), remains home to the largest number of poor and hungry people in the world. About one-third of the world's poor people live in India. More than 450 million Indians exist on less than $1.25 a day, according to the World Bank. It also has a higher proportion of its population living on less than $2 per day than even sub-Saharan Africa. India has about 42% of the population living below the new international poverty line of $1.25 per day. The number of Indian poor also constitute 33% of the global poor, which is pegged at 1.4 billion people, according to a Times of India news report. More than 6 million of those desperately poor Indians live in Mumbai alone, representing about half the residents of the nation's financial capital. They live in super-sized slums and improvised housing juxtaposed with the shining new skyscrapers that symbolize India's resurgence. According to the World Bank and the UN Development Program (UNDP), 22% of Pakistan's population is classified as poor. There is widespread hunger and malnutrition in all parts of India. India ranks 66th on the 2008 Global Hunger Index of 88 countries while Pakistan is slightly better at 61 and Bangladesh slightly worse at 70. The first India State Hunger Index (Ishi) report in 2008 found that Madhya Pradesh had the most severe level of hunger in India, comparable to Chad and Ethiopia. Four states — Punjab, Kerala, Haryana and Assam — fell in the 'serious' category. "Affluent" Gujarat, 13th on the Indian list is below Haiti, ranked 69. The authors said India's poor performance was primarily due to its relatively high levels of child malnutrition and under-nourishment resulting from calorie deficient diets. I did not expect this answer from you. What is great about the country feeding the people when it has oil wealth. What requires is the education and the education's contribution to value development inthe economy. I leave that value development to the ecnomy part for the readers to decide. anon: "What is great about the country feeding the people when it has oil wealth. What requires is the education and the education's contribution to value development inthe economy." It's not just the oil-rich nations that are well ahead of India in terms of widespread literacy and access to education and healthcare. Arab nations without oil, like Egypt, Syria and Jordan, even occupied Palestine are well ahead of India in terms of human development and per capita gdp and incomes. Many of them are investing heavily in developing their human resources and building modern universities and colleges for their young people. Egypt and Syria are self sufficeint in oil which also forms the lion's share of their govt revenue i.e retailing oil. Jordan,Palestine get massive amounts of aid as a proportion of their population from other rich arab countries and also remitances/capita is much much higher than south asia. It is a open secret that egypt syria jordan are soft receivers from the rich islamic countries. Further they have the advantage of the knowing the local language when they seek out employment in middle east. However both the above advantage does not exist for india and indians and still both are doing well. anon: "It is a open secret that egypt syria jordan are soft receivers from the rich islamic countries." India and Africa have been the largest recipients of foreign aid in the last 50 years...having received far more aid than either Pak or any Arab country. If foreign aid were so helpful, then why are India and Africa so backward in terms of basic human development? anon: "Further they have the advantage of the knowing the local language when they seek out employment in middle east." As to the language, it is far more beneficial for any one to know English than Arabic to find overseas employment. A lot more Indians (and Pakistanis) work overseas than Arabs. Egypt's biggest sources of income are the Suez canal and international tourism. But it's been a center learning with many universities for centuries. "Egypt's biggest sources of income are the Suez canal and international tourism. But it's been a center learning with many universities for centuries. and producing 250 patents in 25 years compared to 2000+ in one year by India. Your logic is not impressive. You seem to think that a school which was once great, but is not producing good students to get into top colleges should be preferred over some other school which of late sends more good students to top colleges. "India and Africa have been the largest recipients of foreign aid in the last 50 years...having received far more aid than either Pak or any Arab country." recving aid by itself is not bad. India routinely gets aid for infrastructure project. It is the repaying ability. India does not default and that's why its rating is far better than that of Pakistan. Pakistan takes far more aid than its economy can support. The less about Africa the better. But they are so poor that no one expects the money to be paid back. "India and Africa have been the largest recipients of foreign aid in the last 50 years...having received far more aid than either Pak or any Arab country"
Pls provide information. The day india took the non-alignment and softer stands towards russia which continued till one decade back, india was never in the right side of the rich western countries or the arab countries. You are welcome to provide statistics to the contrary. ""India and Africa have been the largest recipients of foreign aid in the last 50 years...having received far more aid than either Pak or any Arab country." On a per capita basis Pakistan has received vastly more aid by virtue of being frontline state and a member of CENTO/SEATO than India did. Its another matter that it did not use this money to build a industrial base a la S Korea and preferred to concentrate on ''free market economics'. We do get subsidized loans from WB/ADB etc but even China gets them afterall who doesn't want low interest money. Alas the KL bill is probably not the last time Pakistan gets government to government aid. anon: "Pls provide information. The day india took the non-alignment and softer stands towards russia which continued till one decade back"
In spite of all of the recent news about aid to Pakistan dominating the media, the fact remains that resurgent India has received more foreign aid than any other developing nation since the end of World War II--estimated at almost $100 billion since the beginning of its First Five-Year Plan in 1951. And it continues to receive more foreign aid in spite of impressive economic growth for almost a decade. At the recent G20 meeting, India has asked the World Bank to raise the amount of money India can borrow from the bank for its infrastructure projects, according to Times of India. At present, India can borrow up to $15.5 billion as per the SBL (single borrower limit) fixed by the Bank. Britain will spend over $1.5 billion during the next three years in aid to Shining India, a nuclear-armed power that sent a spacecraft to the moon recently, to lift "hundreds of millions of people" out of poverty, the British secretary of state for international development said last year, according to the Guardian newspaper. Douglas Alexander, the first cabinet minister to visit India's poorest state Bihar, said that despite "real strides in economic growth" there were still 828 million people living on less than $2 a day in India. UK's Department of International Development says if the UN's millennium development goals - alleviating extreme poverty, reducing child mortality rates and fighting epidemics such as Aids - are left unmet in India, they will not be met worldwide. Some 43% of children go hungry and a woman dies in childbirth every five minutes. British Minister Alexander contrasted the rapid growth in China with India's economic success - highlighting government figures that showed the number of poor people had dropped in the one-party communist state by 70% since 1990 but had risen in the world's biggest democracy by 5%. The World Bank said recently it will lend India $14 billion by 2012 to help the country overhaul its creaking infrastructure and increase living standards in its poor states, according to Financial Express. The Indian government has estimated it needs $500 billion over the five years to 2012 to upgrade infrastructure such as roads, ports, power and railways. The World Bank loans are considered aid, like most other foreign aid from US or Europe which always always comes in the forms of loans. "The World Bank loans are considered aid, like most other foreign aid from US or Europe which always always comes in the forms of loans. " You have to answer why India's credit rating is far better than that of Pakistan. Secondly why doesn't Indian PM run from country to country with a begging bowl like Zardari and gilani. India, like any sensible country, would love to use low interest loans for its infrastructure rather than use its 300 billion reserves of foreign exchange. Pak needs aid to pay its bill. that's the difference. Last year, Indian Planning Commission member Syeda Hameed acknowledged that India is worse than Bangladesh and Pakistan when it comes to nourishment and is showing little improvement. Speaking at a conference on "Malnutrition an emergency: what it costs the nation", she said even Prime Minister Manmohan Singh during interactions with the Planning Commission has described malnourishment as the "blackest mark". "I should not compare. But countries like Bangladesh, Pakistan and Sri Lanka are better," she said. The conference was organized last year by the Confederation of Indian Industry and the Ministry of Development of Northeastern Region. According to India's Family Health Survey, almost 46 percent of children under the age of three are undernourished - an improvement of just one percent in the last seven years. This is only a shade better than Sub-Saharan Africa where about 35 percent of children are malnourished. India has recently been described as a "nutritional weakling" by a British report. Bangalore: The business environment in Pakistan and Bangladesh is far better than in India. According to the latest 'Doing Business Index', India's business environment has become tougher during the years compared to other nations. Economies are ranked from one to 183 on the basis of their regulatory environment being conducive to business operations. All of India's neighbors except Afghanistan have been ranked better. While India is ranked 133, Pakistan is ranked 85th followed by Sri Lanka (105), Bangladesh (119) and Nepal (123). "India is a consistent reformer for the past many years. A country's rank in the index is an average of 10 indicators, each with 10 percent weight in the index. India increased the number of judges in the specialized debt recovery tribunals, which led to a major removal of blockages. While India reformed in the area of insolvency, other countries reformed in more than one area," World Bank's Senior Strategy Advisor, Dahlia Khalifa told Economic Times explaining why India has been overtaken by other nations. The 2010 Doing Business Report prepared by World Bank and the International Finance Corporation averages a country's percentile ranking on 10 topics, made up of a variety of indicators. This includes examining a country's business environment in terms of starting a business, dealing with construction permit, employing workers, registering property, getting credit, protecting investors, paying taxes, trading across borders, enforcing contracts and closing a business. The first place is occupied by Singapore, which is followed by New Zealand, Hong Kong and the U.S.
To see complete rankings and report, click here: http://www.doingbusiness.org/EconomyRankings/"
“Your hypotheses, sir, have been exposed as deeply flawed. And tragic. And super-human in their stupidity,” the Indian gentleman told me when I explained that the economic miracle in India was mostly ephemeral. Indians, it seems, aren’t lacking in the hyper-patriotic, and India certainly doesn’t lack its boosters in the West. "BANGALORE, India — In the United States and Europe, people worry that their well-paying, high-skill jobs will be, in a word, “Bangalored” — shipped off to India. People here are also worried about the future. They fret that Bangalore, and India more broadly, will remain a low-cost satellite office of the West for the foreseeable future — more Scranton, Pa., in the American television series “The Office,” than Silicon Valley." Stephen Roach of Morgan Stanley-Asia has called this wage arbitrage (Roach happens to be one of the few American economists that gets it right on India). And Americans are right to worry about this. It’s put downward pressure on services as varied as call-centers and tech support, to financial news reporting, X-ray and MRI interpretation and accounting. I would be especially worried if I were an accountant. But then again, many of the big firm accountants need not be worried, as their shilling game for Wall Street will protect them. For a time. "Even as the rest of the world has come to admire, envy and fear India’s outsourcing business and its technological prowess, many Indians are disappointed that the country has not quickly moved up to more ambitious and lucrative work from answering phones or writing software. Why, they worry, hasn’t India produced a Google or an Apple?" Wait a second. India does not have any technological prowess in the true sense of the word. After all, if they did, why would the Ambassador, a car model over fifty years old, made of the heaviest steel imaginable, and horribly inefficient be the best selling domestically produced car in India, still. The Nano notwithstanding. "Innovation is hard to measure, but academics who study it say India has the potential to create trend-setting products but is not yet doing so. Indians are granted about half as many American patents for inventions as people and firms in Israel and China. The country’s corporate and government spending on research and development significantly lags behind that of other nations. And venture capitalists finance far fewer companies here than they do elsewhere." Re-read that graph closely and you’ll begin to get an idea of the hurdles India faces. And hurdles it is doing nothing, absolutely nothing to overcome. Instead of using its domestic capital for something like infrastructure building, local elites continue to siphon it all off and live behind huge fenced in compounds paying dalits pitiful, barely life-sustaining wages. Pakistan has been rated a ‘Rising Star’ in research multiple times over the last couple of years by ScienceWatch.com, a Thompson Reuters website which tracks trends and performance in research by analyzing its database of scientific papers and citations. The ‘Rising Star’ rankings are published every two months to acknowledge new entrants, by identifying the scientists, institutions, countries, and journals which have shown the largest percentage increase in total citations. In the May issue of the ratings, Pakistan was named a ‘rising star’ in two areas, ‘Materials Science’ and ‘Plant & Animal Science’. Amongst other countries of the region, Bangladesh was also listed as a rising star in ‘Computer Science’ and ‘Pharmacology & Toxicology’. Iran was named in four categories, and Qatar and UAE in one category each. Quaid-e-Azam University in Islamabad, the country’s top university in terms of the number of publications per year, has also been recognized as a ‘rising star’ institution, in Jan 2009 and July 2008 issues, both times in the area of ‘Engineering’. The ratings are based on the largest percentage increase and not the absolute numbers, and therefore, cannot be used to quantify research productivity in absolute terms. However, they definitely demonstrate the trend of a substantial increase in international publications from Pakistan compared to previous years. It is very healthy that a number of different areas are covered in these past two years, showing an across the board enhancement of research productivity. While there has been a lot of debate on the effectiveness of HEC’s reforms in higher education, at least one thing is clear: the increased emphasis on research, largely due to HEC’s programs, has started to bear fruit. These are hard numbers here, based on data by the company that maintains the largest scientific citation index in the world, and cannot be easily refuted by the nay-sayers. India has more deaths in road accidents than any other country. During one of my visits to India I nearly got killed when my driver almost ran into an nondescript vehicle on the road between Delhi and Agra. It was a makeshift diesel engine mounted on a wooden cart with no lights or safety devices of any kind being used in near darkness to transport people. After the near-miss, it was described to me as Jugaad, with the warning to stay away from it, and other contraptions like it. It's an all-too-depressing sight on India's chaotic roads. An accident - the crushed remains of a car or a van - and more anonymous victims. There are now more road deaths in India than anywhere else in the world - a man-made epidemic according to a government committee. In 2006 - the latest year for which figures are available - more than 100,000 people died, and an estimated 2,000,000 were seriously injured. The economic and social costs of these shocking figures are enormous. India loses 3% of its GDP to road crashes every year. Many of the deaths happen in rural areas, and one study found that 70% of families who lose their main wage earner in a traffic accident subsequently fall below the poverty line. It is a scourge which claims far more victims than communicable diseases like Aids, TB and malaria combined. And yet far less money is spent on trying to do something about it. "It's a national crisis," said Rohit Baluja, a leading road safety activist. "Not only casualties, but violations are increasing. We need strong political will to bring down the number of accidents." Researchers say creativity should be taken out of the art room and put into homeroom. The argument that we can’t teach creativity because kids already have too much to learn is a false trade-off. Creativity isn’t about freedom from concrete facts. Rather, fact-finding and deep research are vital stages in the creative process. Scholars argue that current curriculum standards can still be met, if taught in a different way. To understand exactly what should be done requires first understanding the new story emerging from neuroscience. The lore of pop psychology is that creativity occurs on the right side of the brain. But we now know that if you tried to be creative using only the right side of your brain, it’d be like living with ideas perpetually at the tip of your tongue, just beyond reach. When you try to solve a problem, you begin by concentrating on obvious facts and familiar solutions, to see if the answer lies there. This is a mostly left-brain stage of attack. If the answer doesn’t come, the right and left hemispheres of the brain activate together. Neural networks on the right side scan remote memories that could be vaguely relevant. A wide range of distant information that is normally tuned out becomes available to the left hemisphere, which searches for unseen patterns, alternative meanings, and high-level abstractions. Having glimpsed such a connection, the left brain must quickly lock in on it before it escapes. The attention system must radically reverse gears, going from defocused attention to extremely focused attention. In a flash, the brain pulls together these disparate shreds of thought and binds them into a new single idea that enters consciousness. This is the “aha!” moment of insight, often followed by a spark of pleasure as the brain recognizes the novelty of what it’s come up with. Now the brain must evaluate the idea it just generated. Is it worth pursuing? Creativity requires constant shifting, blender pulses of both divergent thinking and convergent thinking, to combine new information with old and forgotten ideas. Highly creative people are very good at marshaling their brains into bilateral mode, and the more creative they are, the more they dual-activate. Is this learnable? Well, think of it like basketball. Being tall does help to be a pro basketball player, but the rest of us can still get quite good at the sport through practice. In the same way, there are certain innate features of the brain that make some people naturally prone to divergent thinking. But convergent thinking and focused attention are necessary, too, and those require different neural gifts. Crucially, rapidly shifting between these modes is a top-down function under your mental control. University of New Mexico neuroscientist Rex Jung has concluded that those who diligently practice creative activities learn to recruit their brains’ creative networks quicker and better. A lifetime of consistent habits gradually changes the neurological pattern. FYI it is this Jugaad that has given the world Tata Nano, the cheapest car in the world. India's telecom companies provide calls at Ps. 1 a second, the cheapest in the world. Narayana Hrudayalaya and Shankara Nethralaya provide the cheapest heart and eye treatment in the world. It is this same country that has given the world yoga and ayurveda. The country tht you refer to as undernourished today provides free mid day meals to 12,68,504 students everyday and the count in increasing every day! so to say we do try!! While all you can do is talk anti-India. We don’t do that we speak pro India. I doubt you have the much to talk about Pro-pakistan. At least we have a free press and democratic governance. The UN Human Development Index - which measures a series of economic and lifestyle indicators - ranks Pakistan 134th out of 177 and India 126th. In India and Pakistan, life expectancy is 63.6 and 63.4 years respectively, the adult literacy rates are 61 per cent and 49 per cent and the GDP figures are $3,139 and $2,225. More Indian companies are acquiring foreign companies, attracting FDI and FII than Pakistan by any measure. The international embarrassment that India suffered in the run-up to the Commonwealth Games — marred by massive cost overruns, a collapsed bridge and widespread corruption allegations — has focused attention on a stubborn cultural condition that if not checked, analysts here say, could undercut India's superpower ambitions. An attitude referred to in Hindi as "chalta hai," which translates to "it goes" but can mean "don't be bothered," "whatever," "it'll do," or "don't fret (such problems as corruption, delays, shoddy quality)." Or in the words of one commentator: "It's OK dude, who cares?" As the Games' closing ceremony wrapped up Thursday, the attitude appeared to be borne out. Chaos reigned until opening day of the international sports competition, but India ultimately pulled it off. There were no major terrorist attacks, India won 38 gold medals and dancing and marching bands wowed the closing crowd. As the hangover sets in, however, some wonder why it took prime ministerial intercession to get toilets cleaned in the athletes village, why Indian planning compared so poorly with neighboring China's hosting of the 2008 Summer Olympics and whether a wing-it attitude befits a nation with such talent, potential and prospects. "It doesn't matter if we're a growing superpower or the stock market's at record levels," said Vinod Mehta, editor in chief of the Outlook media group. "What these Games showed is that we've hit the limit on chalta hai." Some see the attitude growing out of Hindu fatalism and rigid social hierarchies. "It's a sense of 'que sera, sera,' pre-destination, you're born upper or lower caste," said Ravinder Kaur, a sociologist at the Indian Institute of Technology. Others cite India's huge population and limited resources, which can leave individuals feeling powerless. "It's a coping device," said Amita Baviskar, a sociology professor at Delhi's Institute of Economic Growth. For Santosh Desai, president of McCann-Erickson India, chalta hai is epitomized by a story his father recounted of a classmate who stole test answers, then only bothered to memorize the bare minimum required to pass. Most cultures have something similar of sorts, including the Latin American "manana" and the Middle Eastern "bukrah, insha Allah" ("tomorrow, God willing") attitudes. India's slack Games preparations epitomized chalta hai thinking, analysts said, but examples are widespread in India. You are absolutely right. A hype just like the BRIC and this word is even used by my professor at U Texas's MBA program last semester. If quick fix is a new terminology then good luck to Six Sigma and ISO standards. I guess there are few Indian professors at the high profile business schools who want to make quick bucks and hoping for respect like Micheal Porter selling crap. Can Thorium Energy Save Planet Earth?